This residential condominium is located on the edge of Ottawa’s Westboro neighbourhood. Hidden away from the street behind an existing building, the project overlooks a park and the Ottawa River. 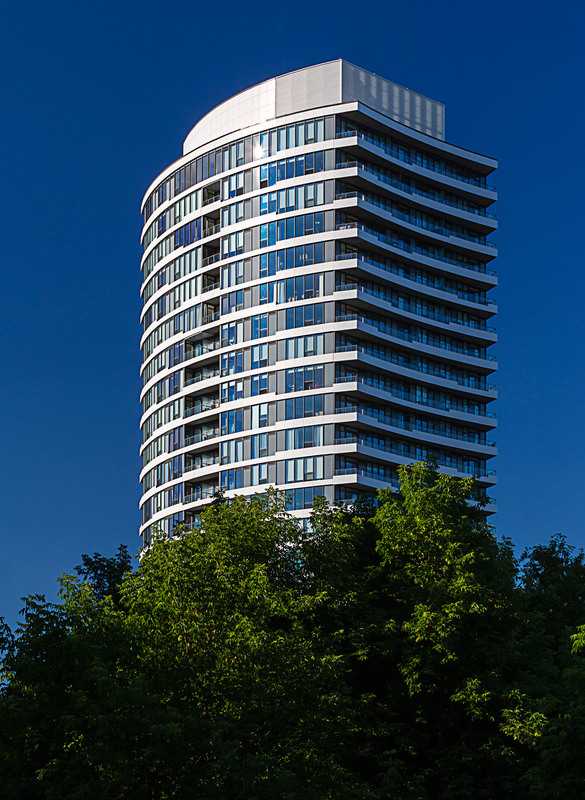 A gently curved 19 storey tower affords panoramic views of the adjacent park and city skyline. The tower is articulated with a dynamic pattern of white horizontal bands, reminiscent of the stratification of the adjacent slope leading to the river. An expansive amenity terrace at the 6th level, where the tower meets the podium, hovers above the tree canopy. Limited opportunity for excavation required the incorporation of above-grade parking in a plinth whose bands of clear and translucent curtain-wall glazing glow at night.